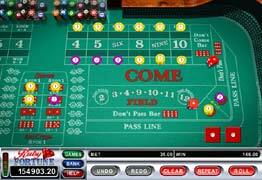 Craps is one of the few truly social games played in modern Casinos, and one of the few played with dice. In the simplest game you place a bet on the pass line and attempt to roll a seven. 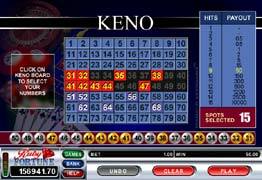 Keno is one of the oldest lottery/gambling games around today. First introduced in China around 200 B.C., Keno originated as a way of raising money for Cheung Leung's army during a years-long war. This was a success, and Keno then spread throughout China, where it was used to help fund the construction of the Great Wall. Keno is a simple game, instantly familiar to anyone who has played a state lottery game. Players mark anywhere from 1 to 20 spots on a ticket, out of 80 possible choices. A machine of some sort selects 20 balls, out of a total of 80. Players win if enough of their choices match the balls drawn. With online Keno, of course, there is no ball cage or even a physical ticket - it is all done by computer. Keno offers better odds and more frequent games than a traditional lottery, but the house advantage is upwards of 30 percent. Almost every winning combination for Keno offers at least 10:1 odds and most are in the 100:1 and up range.